If Paris was the key to unlocking Ireland's Six Nations campaign, Italy represents an opportunity to build momentum into the tests to come. The first and last steps to Grand Slam glory always looked the most difficult and, while they won't be taking their triple-header of home games for granted in the coming weeks, the mission now is to build on the last-gasp heroics against France and create a surge towards Twickenham. 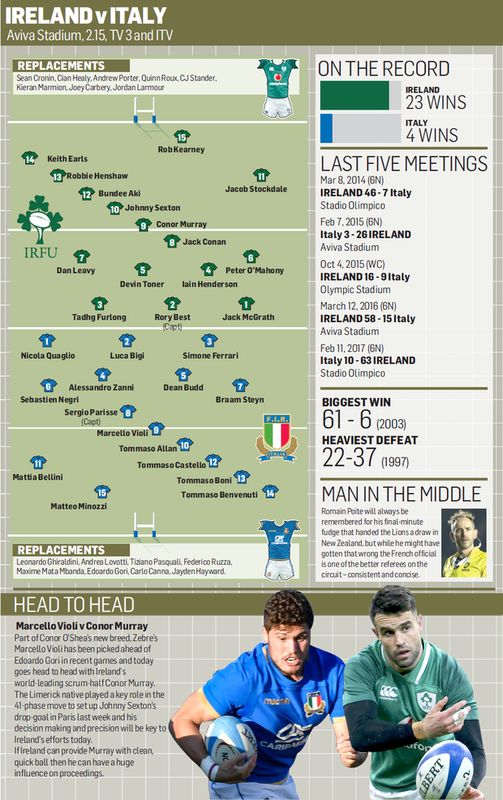 In their last two meetings, Ireland have put 18 tries on the Azzurri who arrive in Dublin on the back of a six-day turnaround after losing heavily to England last weekend. Eddie Jones' three-in-a-row hunters showed their teeth last weekend and Ireland have a duty to respond in kind, if only to ensure they are keeping pace with the champions and Wales who meet this evening in the game of the weekend. 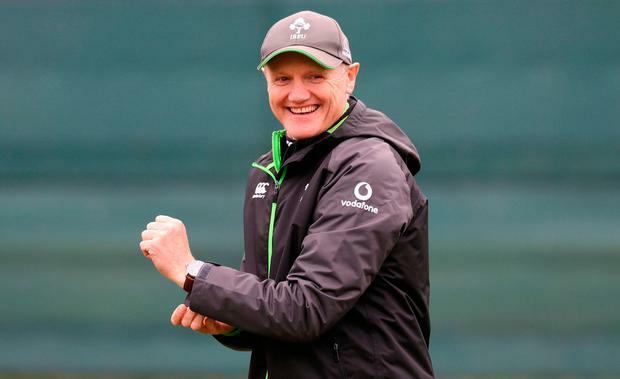 Joe Schmidt is acutely aware of the points race and the need to keep pace. A bonus point is the bare essential requirement today. He has picked a team built to score and a bench laced with impact and change-up. Fans are right to expect a big win. Standing in their way is an Italian side who have tasted Six Nations victory just once since beating Ireland in 2013. Conor O'Shea has been making improvements, but he is trying to catch up to a number of juggernauts operating at full-speed. They played some nice stuff against England last week, but came up well short. Their tries were well-worked, but the scores they conceded were soft by the standards we normally see at this level. If their error count is a high or their defence is similarly porous today, Ireland will have a field day. With conditions likely to be difficult as the long winter rumbles on, the home side will look to ground and pound their way to victory - backing their set-piece and recycling game to wear out the visitors before unleashing a bench with plenty of power in the forwards and guile in the backs. "Certainly, under Joe, the bench has been really, really important and has been something that we've put a lot of pressure on," captain Rory Best said yesterday after leading the final training session at the Aviva Stadium. "I keep using the word pressure, but that's what it's all about at this level and when you look at some of the impacts over the years the bench has had, yeah, this time around there is a lot of firepower to come off it. "If you look at the props, they're two big, powerful, strong men to come on and both are incredibly destructive in the loose, in fact the whole front-row, because Seán Cronin is incredibly destructive in the loose. "So if you look at that, yeah, but I think our bench is something that we pride ourselves on, that they come on and lift the game. "And you can actually see the games that we've struggled in are the games that the bench hasn't come on and done that, and the games we've done really well in and finished strongly, they mightn't necessarily be coming on and scoring a rake of points, they might be coming on and seeing out a really tight game that the bench has been big in and they are a barometer to how well we're going." Schmidt's decision to freshen up his pack while retaining the same backline from Paris indicates a need to build cohesion for the weeks ahead. In particular, it is a chance for Conor Murray, Johnny Sexton, Bundee Aki and Robbie Henshaw to further familiarise each other with the combinations and roles to best ensure that Ireland's attacking game is at its best when Wales come to town in two weeks' time. If the pack can provide clean, quick ball then the backline should flourish. Aki's role has been to carry hard as part of an overall structure, but this may be an opportunity for him to get his off-loading game going. For Henshaw, there is a need to grow his distribution role as Ireland look to reduce their reliance on Sexton. He is enjoying the freedom of outside centre, but the Athlone native is also aware of the need to grow into the tournament. "The first game is always tricky," Henshaw said. "We had two weeks preparation so there's no excuse but the first game is always a little bit, kind of, rusty. You're getting a feel for it and then hopefully we'll kick on this week and kick on. "We're definitely learning more from each other as the weeks go on. Yeah, we'll look to vary it up this weekend. "It's due to be wet but we're really excited to get back out there and the guys are getting more confident." Henshaw says Ireland will not go chasing scores despite the pressing need for a bonus-point victory. "We're looking to start the game well. We're looking to each moment, I suppose, you can't really look towards bonus-point territory at the moment, I think we need to dig it out," he said. "We know they're going to come hard at us and I was impressed by their play last week against England, I thought they were pretty well-coached, I think, and they've got better as a team. "They've got better shape in attack and defensively they're better as well. I think Conor O'Shea has done a pretty good job with them. But I think for us, we need to go our and focus on our ourselves and our own roles. We can't go chasing bonus points." One of Ireland's biggest areas for improvement is their work around the breakdown where France were allowed to slow ball down frequently last weekend. While the officials will play a role, the home side will also look to improve their own part in the ruck. If they can succeed in providing quick ball for Murray, then there are opportunities in the Italian backline. Centres Tommaso Boni and Tommaso Castello struggled against England and the Ireland coaches will have identified areas in the defence to exploit. Ireland should have more than enough in their attacking arsenal to achieve their objective before moving on to the bigger tests ahead.